When it comes to long-term archiving, IT administrators and CIOs battle with a wide range of issues, from space needed to store growing data volumes, to the integrity, durability, and security of the data itself. 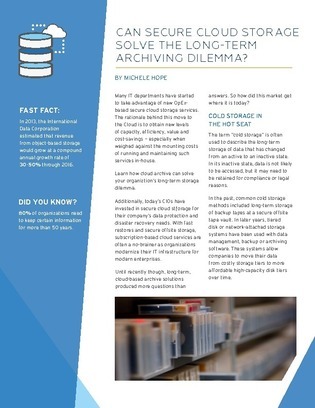 The right cloud archive can solve your organization’s long-term storage dilemma. This white paper explores the cloud-based archive solutions market, and highlights the benefits of object storage as a flexible software construct for digital archives. Together, cloud services and object storage can provide your enterprise with the ability to leverage an object storage repository without building a large infrastructure for it.